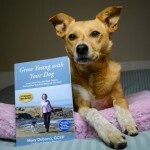 Mary’s book, “Grow Young with Your Dog” is available in paperback and Kindle. You can purchase it from Amazon here. You can also buy it directly from Debono Moves as a downloadable ebook in pdf form. At only $8.97, it’s the lowest price point! Click here to watch Mary’s book trailer video. 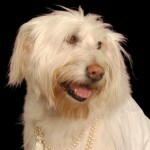 Scroll down to meet several of the dogs from Mary’s book. 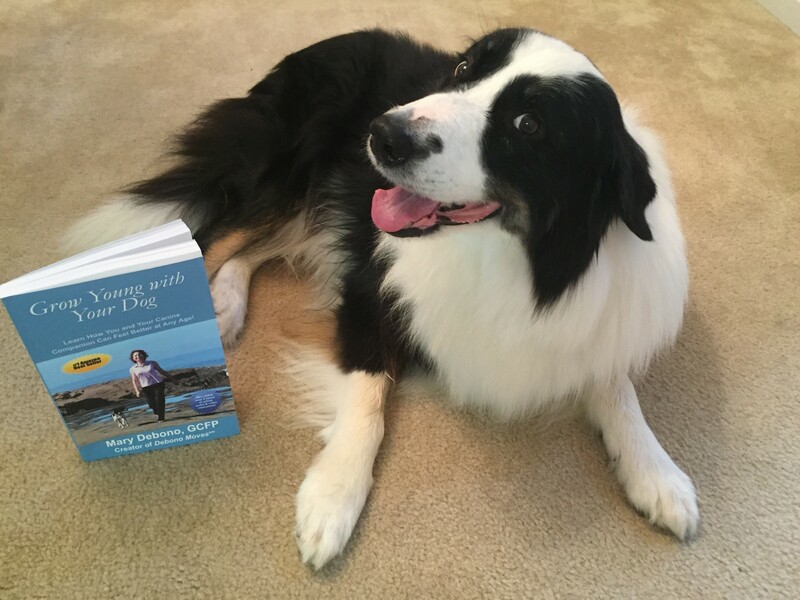 To learn how these dogs overcame debilitating conditions AND how you can help yourself and your dog feel more youthful, get Mary’s book today. 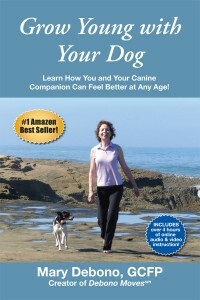 Would you like to learn how to help yourself and your dog feel better – at any age? If so, this book is for you! In addition to the book, you also get access to almost one hour of video and over 3.5 hours of audio instruction – at no cost! Whether you’re a baby boomer with an aging dog or a millennial with a young pup, Grow Young with Your Dog can help you and your dog get the most out of life. The book’s illustrated exercises are uniquely designed to enhance not only your dog’s health and well-being, but yours as well. With this book in hand, you no longer have to choose between spending quality time with your dog and taking care of yourself. 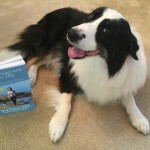 Each chapter has engagingly written stories about Mary’s work helping specific dogs overcome the effects of stroke, arthritis, hip dysplasia, torn ligaments, aging, anxiety and stiffness. 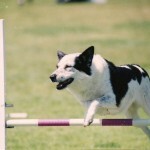 These dogs – many of whom were considered hopeless cases – demonstrate that improvement is possible at virtually any age or condition. When Mary Debono was in her late 20’s, she suffered from a variety of aches and pains. She had bi-lateral carpal tunnel syndrome that resulted in nerve damage, a very painful hip, and stiffness in her back and neck. Although more than two decades have passed since that day, Mary feels younger now than she did back then. Feel and look younger by improving your posture and flexibility. Some of the exercises can even be done while you are sitting. How did she do it? Studying a variety of approaches, Mary spent years exploring how to feel and move more youthfully. As a Guild Certified Feldenkrais Practitioner for the past 20 years, Mary learned that when we stay stuck in our habitual ways of thinking and moving we get physically get stuck too. We develop sore muscles and stiff joints. We hesitate to explore new activities. We become limited in our thoughts and limited in our movements. In short, we feel old. To grow younger, Mary released the habits that kept her stuck in unhealthy patterns, and she learned to think and act in different ways. She discovered that attention to our sensations and movements can help us function more effortlessly, even when faced with aging, arthritis or anxiety. 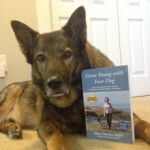 In Grow Young with Your Dog, Mary pulls back the curtain and explains how this unique approach has helped hundreds of dogs and their people enjoy a greater quality of life. In addition to describing twelve basic hands-on exercises to do with your dog, Mary guides you through ten human exercises. These gentle exercises can reduce stiffness, stress, aches and poor posture, while enhancing your flexibility, balance and coordination. Learn hands-on ways to help your dog. Exploring the exercises in this book, you may discover that your body moves more freely, your mind is calmer and clearer, and your spirit more joyful. 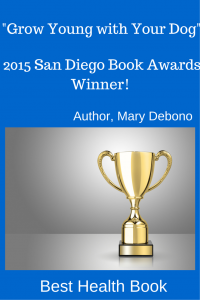 Uniquely enriching the human-canine connection, Grow Young with Your Dog won the 2015 San Diego Book Award for Best Health Book. Click here to watch Mary’s book trailer video. “This book is truly incredible. 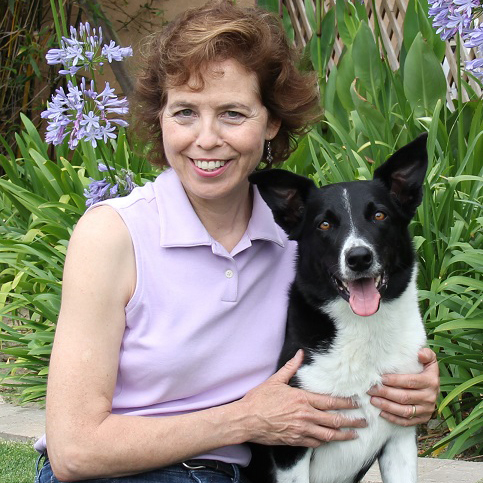 Debono includes real life experiences of how she has helped dogs with her amazing methods, and relates them back to how you can help yourself and your dog feel better! If you purchase the book, you will get free online access to audio and video of several very helpful exercises. 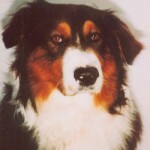 My favorites were the video on Hip and Shoulder Circles (for Wynston’s agility body!) and the audio on easier sitting…because I sit a lot. The videos make it easier to grasp the concept of the exercises and the audio is nice because you can perform the exercises while listening.” – Amanda Yantos, blogger Dog Mom Days. 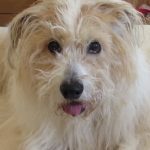 “I have a 15-year old terrier mix who was has very arthritic hips after a fall down a flight of stairs. His tail had been locked down close to his body and he walked with great difficulty. He often fell over because he was so unbalanced. “I have performed the exercises daily on my dog (and on me, as well) and am happy to report that Duffy gets better with each passing day. This morning he even ran down the hall with his tail in the air! 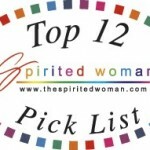 “I love that this book approaches healing by combining the mind, breath, muscles and nerves. The rhythmic movements trigger a response in the nervous system that opens a pathway to healing, helping the muscles re-learn how to move correctly again after months of compensating for pain. 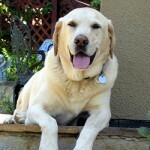 Click on Rolo’s photo to read his “mom’s” review! In this book I describe how I have helped dogs heal completely from injuries and surgeries, move well despite arthritis and hip dysplasia, recover from a paralyzing stroke and run and play again after being classified as “too old to recover”. 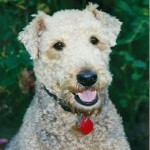 Some of the dogs from the book are pictured below. 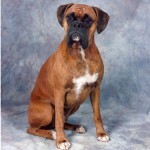 Emma went from hip dysplasia to healthy hips! 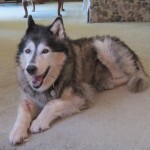 Cassie didn’t let spinal arthritis keep her down! Nikki went from being unable to stand to trotting down the trail! Sonny recovered from a torn knee ligament. You’d never know Juliette had hip dysplasia! Geriatric Rocky improved the use of his hind legs. Otis recovered from a hamstring injury. Nicky healed a neck injury. Unique approach improves both canine and human! Includes exercises to improve flexibility and coordination. Some of the exercises can be done at your desk! 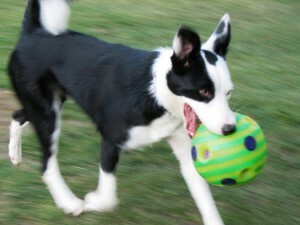 Deepen the bond with your dog. Works with dogs of all sizes and conditions. Wouldn’t you like to grow young with your dog? Get your book today! It’ll make a great holiday gift! Sign up for our free newsletter so you don’t miss out! Another page about Mary’s book. 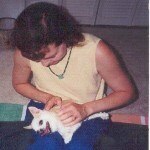 Grow Young with Your Dog® is a registered service mark of Mary Debono. 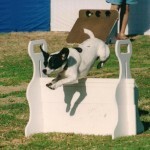 5 Tips to Prevent Canine Sports Injuries – Click here to grab this FREE e-book!